ID Keys: Dull yellow underparts, gray back and breast, darker gray head, white chin. Cassin's Kingbird is very similar to the Western Kingbird and overlaps in range with it, but is found in more wooded habitats than it's close cousin. Their scientific name "vociferans" comes from their noisy, repetitive morning song. Habitat: During the summer breeding season, they are found in semi-open woodlands, including pine forests, oak woodlands, riparian areas, and sometimes in isolated groves. They are generally found in more open habitats during migration and in winter. Diet: Primarily feeds on berries. Will also feed on fruits and berries, more so than most of the flycatchers. Behavior: Forages by flying out from a perch to capture flying insects. They will also hover and glean insects from foliage and branches. Song: Song is an exuberant kideer-kideer-kideer. 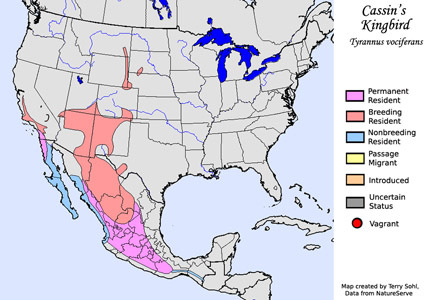 Migration: Summers in portions of the interior West. Winters in Mexico and southward. 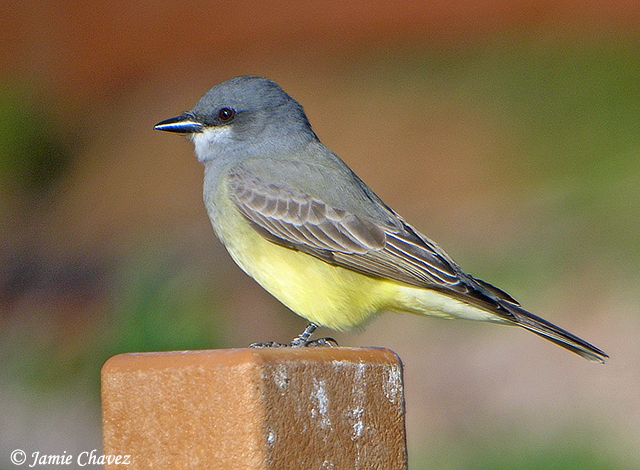 2) Cornell University's "All About Birds - Cassin's Kingbird"
Photo Information: Photo courtesy of George Jameson. South Dakota Status: Casual summer resident in the southwestern part of the state.